The HTEC Conference that was held, for the first time, in Florida was deemed a big success with over 72 attendees from education, manufacturing associations, education vendors, career counselors and invited guests attending the conference in March. Panelists of speakers and presenters included Mireya Eavey from the United Way and CareerEdge collaborative, Jennifer Behrens Schmidt, President of Sarasota-Manatee Manufacturers Association who provided a 360 degree perspective of manufacturing in the region. Dr. Todd Bowden, Director of Sarasota County CTE and Suncoast Technical College narrated first-hand accounts of his experiences at Suncoast Technical College and how the machining program at Suncoast Technical College was revived after almost eight years. students who naturally gravitate to technology. The two hour breakout sessions, Tooling U, Cam Instructor, MasterCam educational, Immerse2learn, Verisurf, NCSimul Machine, Highland DNC, Autodesk Inventor HSM, Sandvik, Florida Dept of Education, EDU factor, Southwestern TrakMill, NIMS and many more provided attendees a closer look at each of these topics and discuss them with industry experts and colleagues. 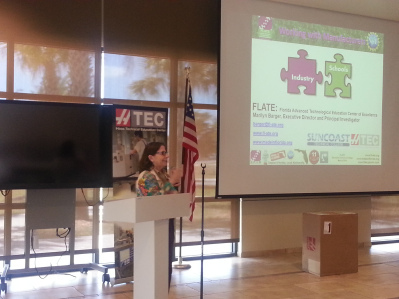 Dr. Marilyn Barger, Executive Director of FLATE provided an overview of the engineering technology programs being offered in state and community colleges across Florida, and its role in technician education and training across the state. James McCann from the Pinellas County school district was the winner of the drawing for a HAAS table top control simulator for lathe and mill. Conference attendees also toured the STC Precision Machining program labs & CNC Automation shop. 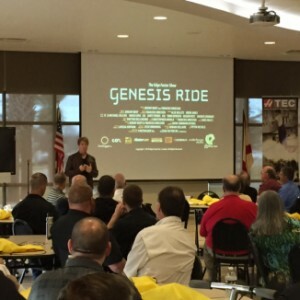 “The day was a great success and I have been getting personal talks and emails thanking STC and HTEC for creating this event” said Ed Doherty, precision machining and CNC instructor at STC who played a leading role in organizing and hosting the HTEC conference. “We hope the word will spread so we can share more ideas for next year” Doherty said. 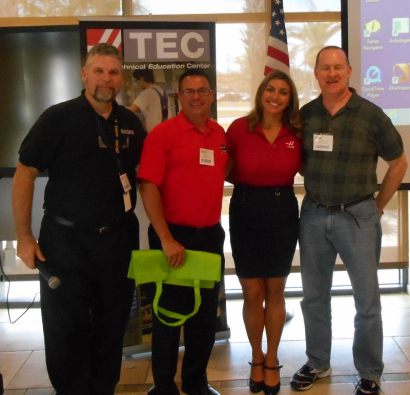 For more information on the HTEC conference and upcoming events read Ed Doherty’s bloghttps://suncoastcncprecisionmachine.wordpress.com, and contact him at Edward.Doherty@sarasotacountyschools.net, or visit www.htecnetwork.org/conferences.cfm. For information on FLATE and its state-of-the art programs visit www.fl-ate.org andwww.madeinflorida.org.